If you’re dreaming of straw cabanas situated on glistening sand that’s tickled by blue waves, it’s time to spend a little time at a spa resort in Bali. Located in Indonesia, gorgeous Bali is known around the globe for its exotic beauty and exquisite biodiversity. Come here to dive for pearls or sip cocktails from hollowed coconuts before being pampered to a massage beneath a tangerine sunset. Of course, scuba diving and snorkeling in the warm waves of the Indian Ocean will be simply magical. Bali is best known for its stunning temples and mystical ruins. You’ll relish the opportunity to visit sacred and spiritual spots like the Tanah Lot Temple, the Tirta Gangga, Kehen Temple, and the Uluwatu Temple during your holiday to this enchanted island destination. It will be easy to think you’ve stepped foot on the set of a fantasy film when you visit surreal and breathtaking attractions like the Ujung Water Palace or the Peliatan Royal Palace. Of course, the top places to soak in the luscious greenery of this island paradise are the Sacred Monkey Forest Sanctuary, the Sekumpul Waterfalls, Bali Bird Park, and Menjangan Island. For those who live for amazing sunsets and fresh air, Bali is simply paradise. Take a moment today to put a holiday to paradise on your calendar using exclusive hotel offers from the world's favourite travel experts. 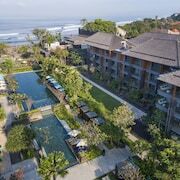 When it’s time to find the Bali accommodation of your dreams, you can count on our huge selection of discount offers. 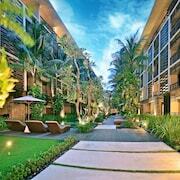 At Expedia.co.nz, we can match you up with rooms at Bali hotels that will fit any budget. Whether you’re looking for a room with ocean views or a suite in the heart of a bustling downtown neighborhood, we’ll help you get what you want with the click of a button. Find a gorgeous room in the shadow of a sacred sanctuary when you browse our flexible options today and choose one that fits your needs. Bali’s year-round warm temperatures and sunny skies make it an ideal place to visit any time of year. In fact, the island's daily temperatures hover between 20 and 33 degrees Celsius throughout the year. 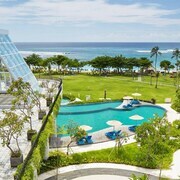 People from across the globe love escaping to Bali for family holidays, romantic honeymoons, and destination weddings. Regardless of why you’re booking a warm getaway, you can hop on a flight to Ngurah Rai International Airport (DPS) to arrive in the heart of the island. The travel tools on Expedia.co.nz are all you need to snag the guaranteed lowest rates around on rooms at lovely Bali beach resorts. We offer access to fabulous hotels and resorts near all of the best attractions on the island. What’s more, you can use our travel packages to bundle the cost of your hotel with a car hire in Bali for one incredibly low rate. Are you ready to dive near coral reefs and retreat to glistening temples tucked away in green forests? Experience the riches of Bali by planning a cheap vacation right here. Explore Bali with Expedia.co.nz’s Travel Guides to find the best flights, cars, holiday packages and more!